Humidity: How Much Does Your Orchid Need? In addition to water and light, when it comes to care for your orchids – humidity is the most important element to keeping your orchid in bloom – and getting it to bloom repeatedly, year after year. Orchids tend to prefer more humidity than most of other plants you keep inside your home. To help your orchids thrive, it is crucial that you provide the required amount of humidity, which is nothing more than the amount of water vapor that is circulating in the air. It is important that you learn how to care for orchids because if you don’t provide the correct amount of humidity, this could result in your orchid’s growth being stunted or could lead to the orchid perishing. If you live in an area that naturally has a high amount of humidity, you may not need to add more humidity inside of your home, however, if you live in a drier climate then you will need to take the initiative to increase the humidity level around your orchid’s growing area. One way to measure the amount of humidity in your orchid’s environment is to use a hygrometer. This device can be ordered online or picked up at any home improvement store. If you are worried that your orchids may not be getting enough humidity, there are a few quick and easy fixes to introduce more humidity to your orchid’s immediate environment and fix that problem. One popular way to increase the amount of humidity around your orchid is set up a humidity tray. 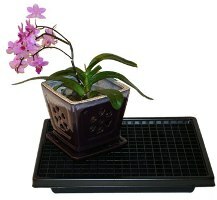 Humidity trays can be ordered online or found in orchid specialty stores. You can also create one yourself by getting a shallow dish or tray, add a layer of pebbles and enough water so that it’s just below the tops of the pebbles, and set the orchid pot on top. You will want to make sure that you don’t let the water touch the bottom of the orchid pot because this could cause the roots to deteriorate when exposed to too much water. When the water evaporates from the dish or tray this will create a humid climate around the plant. As a side note, you will want to clean the pebbles at least once every three months in order to get rid of bacterial buildup. You can use a very diluted bleach solution, but you need to be sure to rinse the pebbles thoroughly with water after you are done cleaning, before you reuse them in the humidity tray or dish. Humidity can also be increased by misting your orchid with water from a spray bottle. Because the water usually evaporates fairly quickly you will need to mist your orchid daily, maybe even several times a day, depending on how dry your climate is. This is also a good way to ensure that the aerial roots don’t dry out. Make sure that after you’ve finished misting your orchid that there isn’t any water standing on the leaves because this can lead to bacterial growth. Another easy and affordable way to increase the humidity around your orchid is to place a cool mist humidifier near the plant a few times a month. A humidifier will raise the amount of water vapor in the air and ensure that the plant is kept moist. If you don’t have one already, they can be easily ordered online as well as picked up from a number of stores. By understanding how to care for orchids and understanding their humidity needs, you can provide your plant with the right amount of humidity to ensure that you will have an orchid that will not only survive, but thrive.